An undated photo of the Wyoming City Hall. The City of Wyoming is not the only municipality to enact ordinances similar to this. 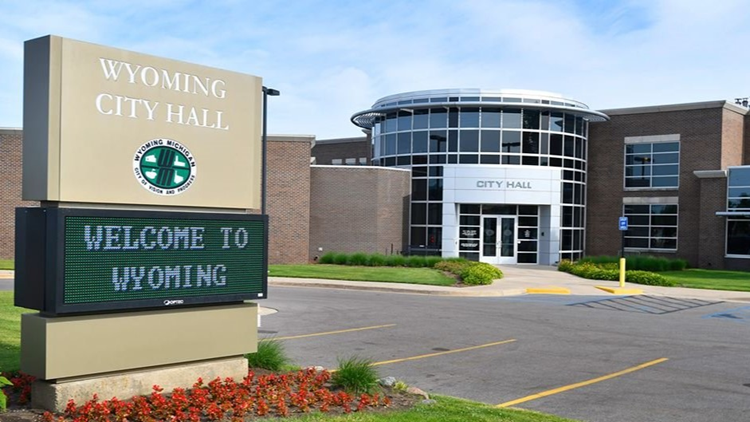 WYOMING, Mich. - At Monday night's Wyoming City Council meeting, the council approved ordinances that would prohibit recreational and medical marijuana facilities in the city. The amendments allow the city to regulate the recreational use of marijuana much like alcohol. They also approved a measure to prohibit the public use of marijuana in the city. According to the city council's agenda, both of those ordinances have an immediate effect, being put into place just days before recreational marijuana is officially legalized in the state of Michigan on Dec. 6. Council approves Ordinance 19-18 which prohibits recreational marihuana establishments and Ordinance 20-18 which amends the City's code to regulate the recreational use of marihuana much like alcohol. Both ordinances bring the City into compliance with the MRTMA. The City of Grand Haven, Spring Lake and Hudsonville all decided to prohibit the sale of marijuana and its use in public places. However, those jurisdictions are all in Ottawa County, where the majority of residents voted against Proposal 1. Wyoming is in Kent County, where 55 percent of voters approved the proposal. Municipalities can make several decisions regarding recreational marijuana, from banning it to limiting the number of licenses and facilities. While marijuana is banned in public places in Wyoming, it is still legal for residents to use recreational marijuana on private property.